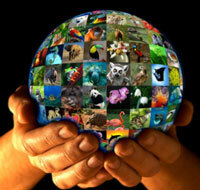 World’s wildlife trade regulator focused on front-line action. Pangolins, whales, elephants, precious timber on the priority list for 2018.
whales, elephants, precious timber on the priority list for 2018. Suspension of trade with 5 countries for failing to submit annual reports and another 2 for lack of adequate legislation. Geneva, 4 December 2017 – The CITES Standing Committee has concluded its largest meeting, skillfully maneuvered by the Committee’s first female chair, agreeing on concrete and focused actions. “This week’s Standing Committee meeting has once again shown the real-world impact of CITES. Well-targeted implementation has been the focus of the Committee. The political will generated over recent years is translating into the scale of funding and technical support needed to deliver on the ground-breaking decisions adopted at last year’s World Wildlife Conference – CoP17. The Convention is continuing to evolve and there is never a dull moment with CITES”, said CITES Secretary General John E. Scanlon. The request by Madagascar to export its stockpiles of thousands of tonnes of seized or ‘declared’ rosewood and ebony was not accepted by the Committee. The Committee decided to maintain the current suspension of trade. In response to the continued need to address the ‘rosewood crisis’ in the country and get legal timber trade on a sustainable footing, Madagascar is requested to strengthen measures against illegal logging and trade, including seizures, investigations, arrests, prosecutions, and sanctions. An audited inventory of at least a third of the stockpiles of logs, sawn wood and veneer sheets of ebonies, palisanders and rosewoods, accompanied by a detailed use plan, must be submitted for consideration and approval by the Committee, upon which Madagascar may be allowed to export the precious timbers. In response to the growing concerns of the significant level of international trade in kosso rosewood (Pterocarpus erinaceus), the Committee decided that Parties should not accept any CITES permit or certificate for Pterocarpus erinaceus issued byNigeria unless its authenticity has been confirmed by the CITES Secretariat. A technical mission will be sent to Nigeria to assist coordination between CITES and customs authorities. Pangolins, the most trafficked mammals in the world, are still facing serious threats from illegal trade, although international trade in all the 8 species found in Africa and Asia is banned under CITES. The largest seizure in China was announced during the meeting, with scales coming from an estimated 20,000 pangolins. Specific recommendations were adopted to strengthen enforcement efforts to combat illegal trade in pangolin specimens, including risk-profiling and capacity-building interventions to enforcement officers at ports, enabling them to better target illegal trade in pangolin specimens, as well as to maintain an inventory of stockpiles of pangolin scales and other specimens. Partner agencies of the International Consortium on Combating Wildlife Crime (ICCWC) were encouraged to provide support to key Parties in Africa and Asia on analytical work, targeted investigations, operational information exchange and the development of operational plans, to target and address the criminal networks involved in illegal trade in pangolin specimens. The listing of new rosewood species under CITES at CoP17 has made a large impact on the business operation of guitar makers and other string and wind instrument industries, since the cross-border movement of the musical instruments containing such wood now requires a CITES permit. In response to the concern of the musical instrument industry, the Committee accepted the interim interpretations of certain terms used in the CITES listing, including the interpretation of the term “non-commercial” so that a universally agreed procedure to allow such movement can be simplified until Parties meet at CoP18 in Sri Lanka to review the definitions. The musical industry was well represented at the meeting and contributed to this decision-making process. The Standing Committee considered if any new countries should be included in the National Ivory Action Plan process, and decided to request Qatar, a country that plays a significant role as transit country for illegal ivory consignments moving from Africa to Asia, to develop and implement a NIAP. With regards to other possible new countries to participate in the NIAP process, it was decided not to include Japan, Singapore, South Africa and Sri Lanka in the process, but progress made by these Parties in addressing illegal ivory trade as it affects them will be closely monitored. The Standing Committee also reviewed progress made with NIAP implementation by countries already subject to the process (Angola, Cambodia, Cameroon, Congo, the Democratic Republic of the Congo, Egypt, Ethiopia, Gabon, Lao People’s Democratic Republic, Mozambique, Nigeria, and the United Republic of Tanzania). The Committee issued warnings to four Parties (Cameroon, Egypt, Ethiopia and the United Republic of Tanzania) that had not submitted a report on progress, and agreed that a suspension of all trade in CITES listed specimens will be imposed on these Parties, if they do not report within 60 days of the conclusion of the meeting on progress. The Committee agreed to also keep monitoring progress of a number of Parties which had substantially achieved their NIAPs (China, including Hong Kong SAR of China, Kenya, the Philippines, Thailand and Uganda) but continue to be affected by illegal trade in ivory. The Committee also requested Malaysia and Viet Nam to revise and update their NIAPs, and to continue implementation. A number of Parties were commended for the positive progress they have made (China, Hong Kong SAR, Kenya, the Philippines, Thailand and Uganda). The Committee also welcomed the progress made by Mozambique. The Committee requested the CITES Secretariat to review the responses provided by Japan and determine whether there is additional information to be considered. The Committee also requested the Secretariat, at the invitation of the Government of Japan, to conduct a technical mission to the country to assess the scientific, administrative and legislative arrangements for authorizing the introduction from the sea of specimens from the North Pacific population of the sei whale; and report its findings and recommendations to the 70th meeting of the Standing Committee (SC70) to be held in Sochi (Russian Federation) in October next year. The CITES Secretary-General will be invited to conduct a high-level mission to Mexico in February 2018 to see first-hand the on-going efforts to conserve the highly threatened vaquita, and combat illegal fishing of and trade in totoaba, a fish sharing the same habitat. International trade in both vaquita and totoaba is banned. Totoaba swim bladders are in demand in China, and often smuggled via the United States. The mission will try to generate high-level political support for the conservation efforts. The Committee recommended Parties to suspend trade with Brunei Darussalam, Djibouti, Dominica, Equatorial Guinea and Saint Vincent and the Grenadines because they have failed to submit annual reports for three consecutive years. It also recommended a trade suspension against Mongolia and Tunisia for their lack of progress in adopting adequate wildlife legislation. Matters related to a great diversity of other species, such as Asian big cats, African lions, cheetahs, great apes, helmeted hornbills, tortoises and freshwater turtles, rhinos, sharks and rays, sturgeons and paddlefish, were also on the agenda. The Committee also reviewed capacity-building needs, compliance matters, combating wildlife cybercrime, demand reduction, engagement of rural communities in the CITES processes, introduction from the sea, livelihoods, transport of live specimens and periodic review of the Appendices. 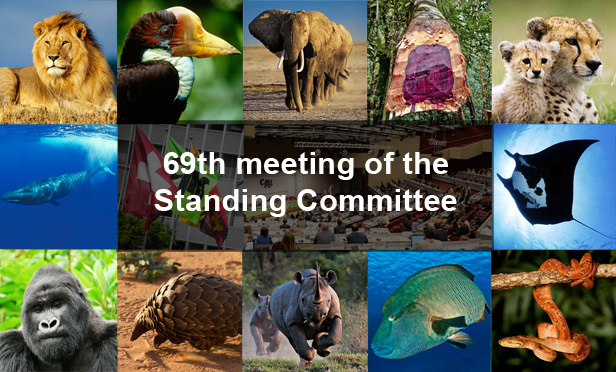 The Committee decided that the 70th meeting of the CITES Standing Committee will take place in Sochi, Russian Federation, from 1 to 5 October 2018. Sri Lanka, which attended this meeting of the Standing Committee as the host country of the next meeting of the Conference of the Parties, announced that CoP18 will be held in Colombo in May 2019.